On the morning of April 18, 1906, most of the residents of the city of San Francisco were sound asleep when the ground started to shake. But what started as fairly soft tremors turned into a violent shaking in all directions. The roar of the earthquake unquestionably woke up residents, at least those fortunate enough not to be immediately swallowed by the cracks opening up in the ground. The earthquake lasted about a minute, but it had enough destructive force to divert the course of entire rivers and level much of the ninth-largest city in America at the time. Unfortunately for San Franciscans, the worst was yet to come. During the earthquake, the city's gas mains and water mains were ruptured, which had the effects of starting a number of fires and preventing the residents from being equipped to fight them. 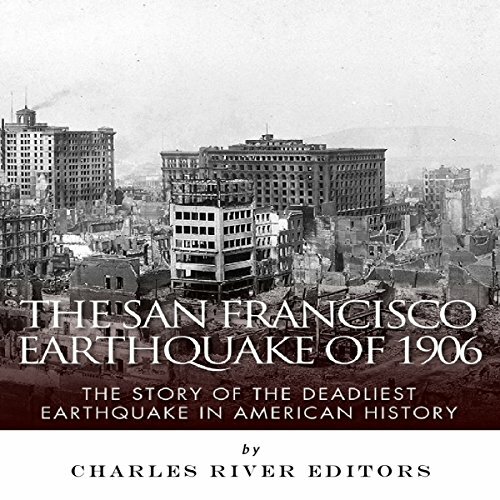 Would you consider the audio edition of The San Francisco Earthquake of 1906 to be better than the print version? What about Kat Marlowe’s performance did you like? Although this is a short book, it was an incredible tale! I enjoyed the sections of first person accounts the most! Seeing it from their own eyes really brought this audio book to life! It's hard to imagine the terror, the heart ache and the determination to rise above and rebuild! It's part of our American spirit and I'm grateful to be a part of this wonderful country! Probably worth the one hour it took. What does Kat Marlowe bring to the story that you wouldn’t experience if you just read the book? Could you see The San Francisco Earthquake of 1906 being made into a movie or a TV series? Who should the stars be? The relating of this issue could have been much better. Where does The San Francisco Earthquake of 1906 rank among all the audiobooks you’ve listened to so far? Parts were hard to follow with the different cadence of speach from that time but overall, very facinating. I like that even with how long ago this occured, there are still several "eye witness" accounts. People talked slightly different back then, Kat did wonderful with those differences in speech patterns. Some of the choices the army were hard to listen to. I admire the firefighters and the challenges they faced in fighting the fires resulting from the quake. I always enjoy Kat Marlowe's narrations. She speaks clearly and with passion. She makes a great storyteller. This was the first time I listened to a documentary. I watch documentaries on television all the time, but I found listening about the earthquake very interesting. I actually learned quite a bit since I really didn't know too much at all. The narrator held my attention throughout which is something I probably wouldn't have been able to do reading the book on my own.